A video finds the jihadists admit using chemical weapon in Syria while a Turkish court indictment by the Turkish prosecutors into the alleged use of chemical weapons by the jihadists in Syria has once again highlighted fears that sarin gas was used by the jihadists..
A video has emerged of an opposition rebel militant in Syria apparently confessing to using chemical weapons in order to follow Osama Bin Laden's mantra of killing women and children. The individual in the clip, Nadeem Baloosh, is a member of an insurgent group called Riyadh Al Abdeen, which is active in the Latakia area of Syria . Baloosh ponders if it is acceptable to harm women and children before quoting the Koran, “Fight them as they fight you.” He goes on to quote Osama Bin Laden (whom other rebel groups have openly praised). “We'll kill their women and children like Sheikh Osama Bin Laden said – “until they cease killing our women and kids,” he states. “We will strike them in their homes, we will turn their day into night and their night into day,” adds Baloosh. The footage adds to the increasing weight of evidence that suggests US-backed rebels possess and have used chemical weapons on more than one occasion, although such reports have been habitually downplayed by the mainstream media. Carla Del Ponte, the leading member of the UN inquiry into the attack, which happened in March, told Swiss TV that there existed “strong, concrete suspicions but not yet incontrovertible proof” that rebels were responsible for the atrocity. The Syrian rebels in the Damascus suburb of Ghouta admitted to a reporter that they were responsible for last month's chemical weapons incident which western powers have blamed on Bashar Al-Assad's forces, revealing that the casualties were the result of an accident caused by rebels mishandling chemical weapons provided to them by Saudi Arabia . Despite the fact that the report was written by credible Associated Press and BBC correspondent Dale Gavlak, it has received virtually zero mainstream attention. Kilometer. Footage was also leaked showing opposition militants testing what appeared to be nerve agents on laboratory rabbits. 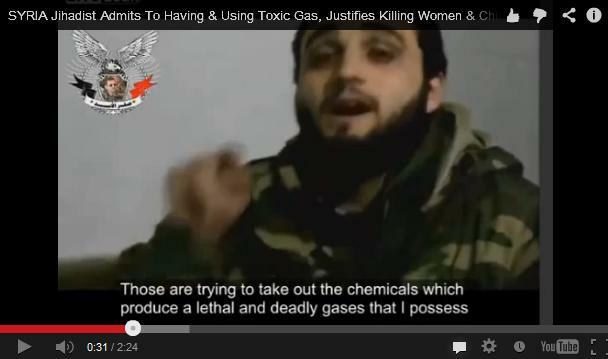 There are also multiple other videos which apparently show US-backed rebels preparing and using chemical weapons. The prosecutor in the Turkish city of Adana has issued a 132-page indictment, alleging that six men of the al-Qaeda-linked al-Nusra Front and Ahrar ash-Sham tried to seek out chemicals with the intent to produce the nerve agent, sarin gas. The indictment alleges that Qassap tried to setup a network in Turkey in order to obtain chemical materials for the al-Nusra Front and Ahrar al-Sham Brigades. Citing telephone calls made by the cell, the prosecution believes that the group ordered at least ten tons of chemicals. The prosecution also dismissed claims that the suspects were unaware of their wrong doing. “The claim that the suspects didn't know about the possibility of producing sarin nerve gas from the chemicals they tried to buy is not true which was established when they were testifying,” the document reads. Meanwhile all six suspects have pleaded not guilty. “The suspects have pleaded not guilty saying that they had not been aware the materials they had tried to obtain could have been used to make sarin gas. Suspects have been consistently providing conflicting and incoherent facts on this matter,” the indictment said. The six men were a part of a group of 11 people arrested in their safe house in Adana on May 23, 2013 . Their apprehension came about after surveillance by Turkish police who'd received a tip that Syrian jihadists were trying to acquire two government-regulated military-grade chemical substances. Five of the detained were released from custody after questioning, background checks and after lab tests proved that chemicals seized during the arrest were not sarin gas. Evidence that chemical weapons were used by the opposition was also highlighted by the two European hostages that were freed from Syrian rebel captivity last Sunday. In a phone conversation overheard by hostage Pierre Piccinin da Prata, he said it was clear the rebels used gas on civilians in an August 21 attack near Damascus . Russian experts flew out to the site of the attack in March to collect samples from the incident. On 9 July 2013 , Moscow submitted the results of its inquiry into the use of chemical weapons at Aleppo to the United Nations. Russian scientists analyzing the March 19, 2013 attack found that it was most likely launched by opposition forces, and not the Syrian government. “It was determined that on March 19 the rebels fired an unguided missile Bashair-3 at the town of Khan al-Assal, which has been under government control. The results of the analysis clearly show that the shell used in Khan al-Assal was not factory made and that it contained sarin,” said Russia 's UN envoy Vitaly Churkin. The United Nations independent commission of inquiry on Syria into the attack in March concluded that no evidence of the use of sarin by Syria 's government troops has so far been uncovered. The lead investigator, Carla Del Ponte, did hint that it was the rebels that most likely used the chemical weapons. “The Independent International Commission of Inquiry on the Syrian Arab Republic wishes to clarify that it has not reached conclusive findings as to the use of chemical weapons in Syria by any parties to the conflict. As a result, the Commission is not in a position to further comment on the allegations at this time,” the statement read. Meanwhile, the UN chemical weapons inspection team has completed the report on the latest chemical attack in Syria on August 21 and will deliver it to UN Secretary General Ban Ki-Moon. Probes from Syria 's Khan al-Assal show chemicals used in the March 19 attack did not belong to standard Syrian army ammunition, and that the shell carrying the substance was similar to those made by a rebel fighter group. By such means “the way is being paved for military action” against Damascus , the ministry pointed out. But the samples taken at the site of the March 19 attack and analyzed by Russian experts indicate that a projectile carrying the deadly nerve agent sarin was most likely fired at Khan al-Assal by the rebels, the ministry statement suggests, outlining the 100-page report handed over to the UN by Russia . The findings of the report are “extremely specific,” as they mostly consist of scientific and technical data from probes' analysis, the ministry stressed, adding that this data can “substantially aid” the UN investigation of the incident. The hype around the alleged attack on the eastern Damascus suburb of Ghouta showed “apparent attempts to cast a veil over the incidents of gas poisoning of Syrian army soldiers on August 22, 24 and 25,” the ministry said, adding that all the respective evidence was handed to the UN by Syria . Watson is the author of Order Out Of Chaos. He is also a host for Infowars Nightly News.